Another new Pokemon joins the Pokedex in Pokemon Go: artistic creature Smeargle. You won’t just find it out in the wild, however – and on this page we’ll explain how to catch Smeargle, plus other vital info like the best moveset once caught. Smeargle ins one of the very latest gen 2 Pokemon to join the world of Pokemon Go, but it’s been absent for good reason: developer Niantic clearly had a clever idea around how to catch Smeargle that they wanted to implement – but that required a whole new feature to arrive in the game first. That time has finally arrived, with it being added to the game alongside Clamperl and its evolutions in the most recent updates. There’s actually a little clue as to how to catch it in the all-new splash screen that shows up every time you boot Pokemon Go, if you look closely… Here’s how it all works and how to get your hands on this, the final gen 2 Pokemon. Complete that Hoenn Pokedex! 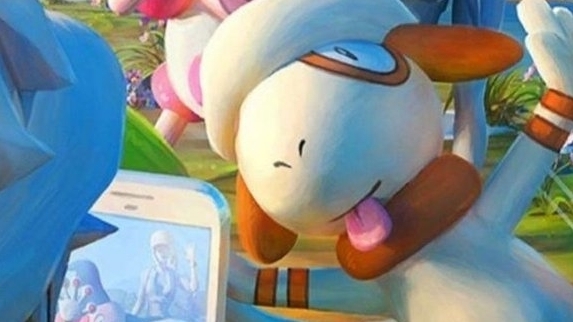 The clue of how to catch Smeargle is in that splash screen, like we said – and as you can see in the cropped version above, that slash loading screen involves a trainer taking a photo, with the artistic Pokemon Smeargle photo-bombing into the shot. All you have to do is recreate this in real life using the in-game snapshot feature. First, you need to open the camera snapshot feature. You can reach it either through the camera in the items menu or by pressing the camera button that now appears when viewing a Pokemon in your Pokemon list. In here, you’ll use augmented reality mode to take AR photos with the Pokemon you’ve selected. Here’s the catch: you now have an entirely random chance of encountering Smeargle. Smeargle can appear at random on one of the photos you’ve taken when you back out of the snapshot mode and close the camera. When Smeargle chooses to grace one of your photos, the game will pause and focus on the photo where it appears, so you’ll know quite clearly when it happens. Once Smeargle has appeared on a photo, back out to the main screen of Pokemon Go, the map. You’ll now see one spawn right nearby you on the map. Be careful here – if you’re moving (like in a car or on a train), you’ll zip away from the spawn before you get a chance to interact with it. Hit the Smeargle and you’ll have the to catch it like any wild Pokemon. Unlike other event-like Pokemon encountered through things like Field Research Mission Rewards, Smeargle is a regular wild encounter which means it can flee if you’re not careful. Catch it fast. One thing that’s absolutely key to understand is that the chance of Smeargle appearing – or reappearing if you want a second – is completely random. Pokemon Go players should be used to random chance by now, but keep that in mind – it could appear on your first photo, or it could appear on your four-hundredth or something. Keep at it. Smeargle will only spawn once per day, so don’t bother spamming photos after catching one until the next day. Once it spawns, Smeargle will actually remain in the wild for a good while – an hour – so don’t panic to catch it right away (but try to nab it fast once you start the actual encounter). There’s currently some known bugs in terms of how it displays in the Pokedex, so if it looks off don’t panic. As just mentioned, the moveset of Smeargle is directly determined by the moves of the Pokemon it’s photographed with when it spawns. Pretty much every move can be learned by Smeargle this way with a few exceptions that wouldn’t make sense, like Ditto’s ‘Transform’ move. But what moves might work best? Flying, Fairy and Psychic moves can be useful, as they’ll work as counters to Fighting-type moves – and as a Normal-type Pokemon, this artistic creature is weak to fighting Pokemon. From Smeargle’s main move set, the most immediately viable move set purely based on stats and number crunching would likely be Shadow Claw and Rock Slide. It has a huge move pool, however – as large as Mew’s – so using TMs on it is a waste and a mistake. If you’d like to use it for gym defense, Confusion & Hydro Cannon are a solid option. For attacking, you should drop Confusion but keep Hydro Cannon. Because it can copy any moves, you can also kit this Pokemon out with one of the best raid movesets for DPS: Pound and Hydro Cannon. Ultimately Smeargle is unlikely to become a staple of a fighting team – candy is difficult to come by thanks to how you catch it and it isn’t that strong to begin with – but these are a few ideas for if you want to try to make it more viable.